Our audit professionals are experts in the latest accounting standards and emerging issues. We offer the highest level of assurance, and provide financial insight based on decades of experience, to help you better understand and manage your business. In addition to providing compiled, reviewed, or audited financial statements tailored to your specific needs and time schedule, our experts will evaluate your financial position, identify potential risk areas, and provide recommendations for improvement. We also provide an array of services to help you manange your business, make critical financial decisions, and increase your overall efficiency and profitability. 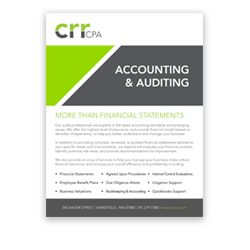 Check out our most recent Accounting blog posts!